We were asked for comment on housing recently by the Irish Independent and had this to say on social housing: Karl Deeter, of Irish Mortgage Brokers, suggests that sites be released for social and affordable housing schemes, or private homes, in return for equity. Developers would have little cause for complaint. “On a vacant site (in Dublin city centre), you could build an eight-storey building with 75pc of the building rented at 20pc below market, and for the rest you have a guaranteed upward-only rent review of 2pc a year,” he says. 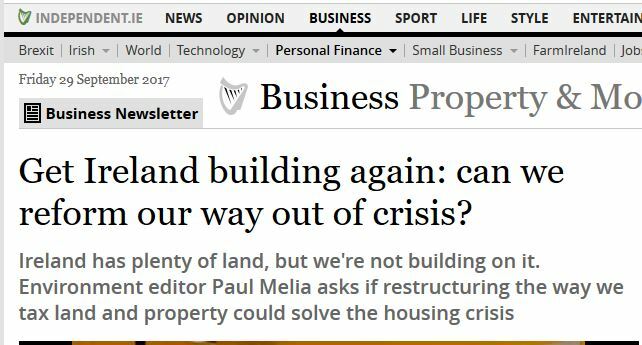 “If we do it on a build to sell, or build to rent, we share the profits..
“We need to flood the land market. People want to talk about the law of the jungle, but you can’t be a lion, and when a rhino comes along you complain. The general view in our opinion is that much of the malaise always comes back to the base element of housing which is land.